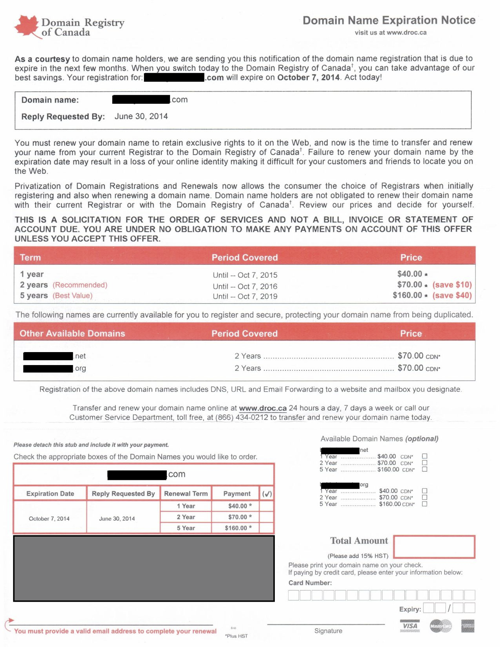 I have been frustrated with this Domain Scam for a long time now. I have a few domain names, and I happen to be in Canada. There is a company called “Domain Registry of Canada” that mails out official-looking envelopes (it looks like a government-issue brown windowed envelope) to everyone that has WHOIS information indicating they live in Canada. This is an example of the letter they send. Unless you read it quite carefully, and know what is going on, you might think you need to pay their (very expensive) domain registration fees in order to avoid losing your domain name. This is NOT TRUE. Consider that many people, like myself, purchase hosting from a company like 1 & 1. Part of the package includes free domain registration for one domain. There is very little technical know-how required to get this going. In fact, it could be that some hotshot young web developer has set this up for you. You need to do nothing except keep paying your web hosting amount to safely retain your domain name. This letter conveniently omits this fact. They do make this somewhat clear in ALL CAPS halfway through the letter, but only after the scare tactics a couple of paragraphs above. Is it strictly a scam? No, I guess not, they do provide a service, and they spell out everything in this letter, but it’s very dirty. To make this abundantly clear: There is NEVER any reason to do anything except shred this letter. For more information, feel free to Google “Domain Registry of Canada” and look at any link that is not their official web page (i.e. start at the second link). Here’s a link to make it even easier. You will find many other bloggers, most more capable than myself, that explain this quite well.